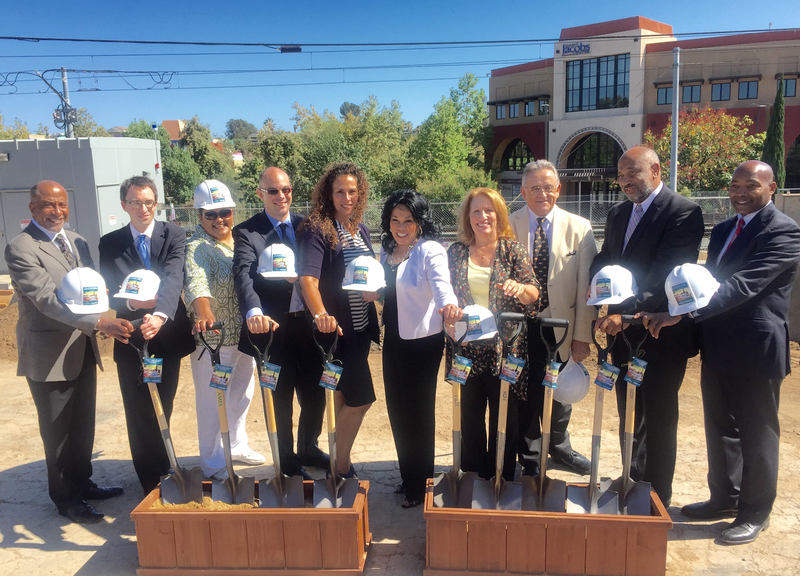 Revitalization is on a roll in Southeastern San Diego! 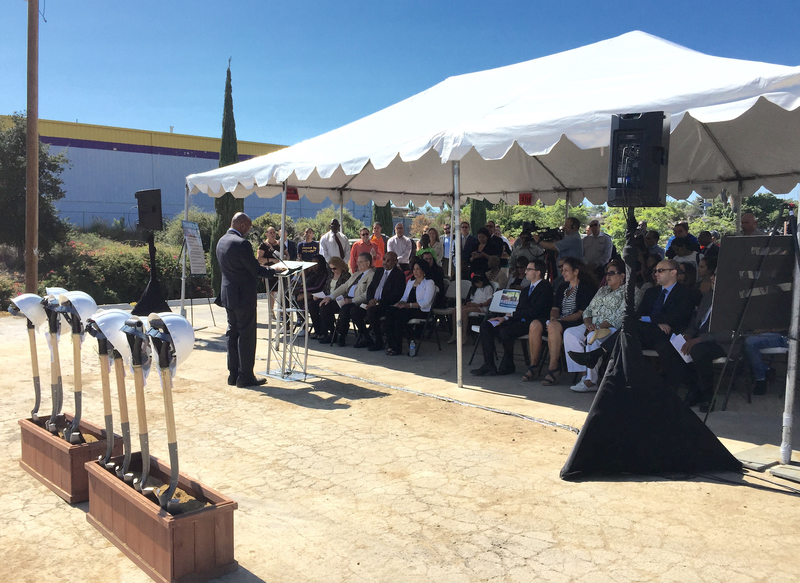 Yesterday, residents, community leaders, and other design and construction professionals gathered to celebrate the start of construction on 52-units of affordable multi-family apartment homes coming to Southeastern San Diego’s Diamond Neighborhoods. The Jacobs Center for Neighborhood Innovation and their development partner Chelsea Investment Corporation held a groundbreaking ceremony at the future site of the new apartments at the southeast corner of Market Street and Market Creek Place Driveway adjacent to the MTS Euclid Transit Station. This was the third ceremony in six months held to celebrate milestones in the Jacobs Center’s redevelopment projects. The Jacobs Center’s Stephen Maduli-Williams addresses the crowd. More quality housing is vital to the revitalization of the Diamond Neighborhoods and to encouraging more investments in the community. 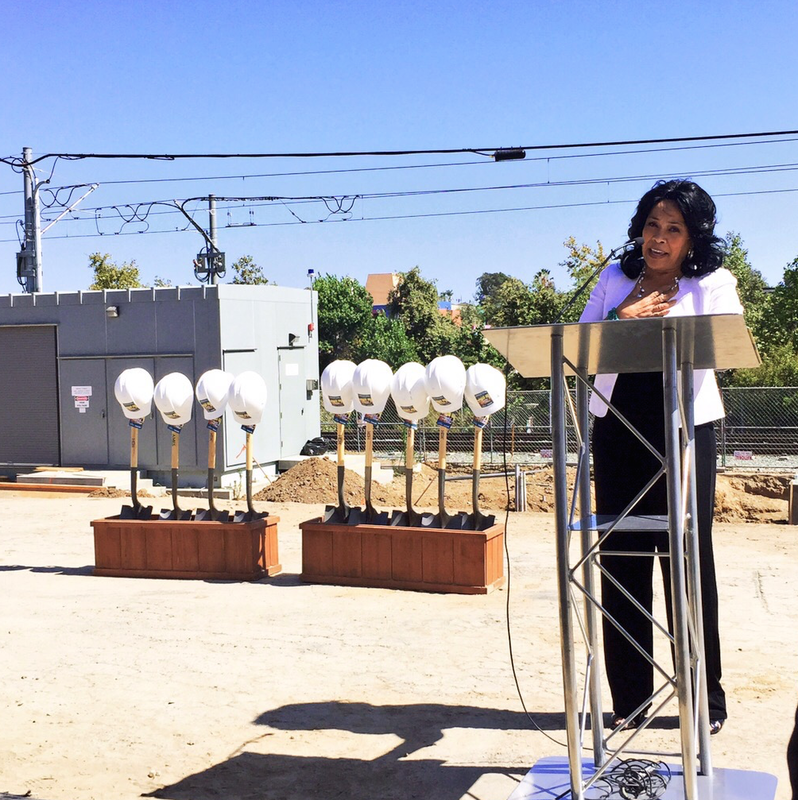 This residential project will help to create a more walkable community and better connect residents to public transportation. It is also a part of the Jacobs Center’s plan to develop the approximately 50 remaining acres of land they own over the next 15 years. The ultimate vision is to transform the area into a Neighborhood Innovation District. This new district will be supported by physical assets like redevelopment projects, networking assets that create spaces for residents to interact and be inspired in order to spur economic growth, and economic assets that support community programs that hire locally and provide opportunities to cultivate higher wage jobs. The Jacobs Center finds ways to involve residents and incorporate their input in its projects whenever possible. At our most recent Town Hall meeting we asked residents to help us decide on the name for this residential project. The name selected by the community is Trolley Park Terrace! A Construction Careers Recruitment event is being held today from 3-5 p.m. at the Joe & Vi Jacobs Center Community Room located at 404 Euclid Avenue, San Diego, CA 92114. Trained and untrained construction workers interested in building these new apartment should come by to meet with the general contractor Emmerson Construction. Additional recruitments will occur onsite including construction staffing companies, subcontractors, “Earn and Learn” apprenticeships, and training providers. More information on the event can be found here. We look forward to welcoming many new families to their new homes when construction is complete. There is no waiting list for the Trolley Park Terrace townhomes at this time. The application process will be handled by the Property Management company selected for Trolley Park Terrace. When we have a Property Management company secured and they are ready to begin the application process we will announce it to the community.